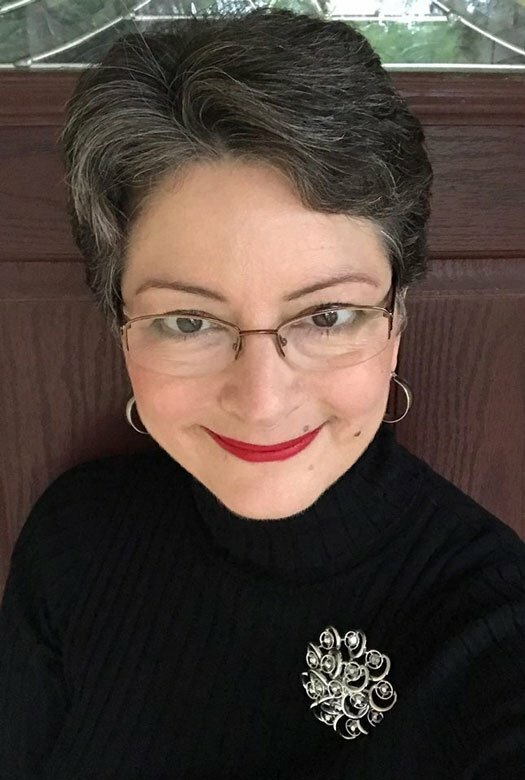 My story of graying hair is pretty average and non-eventful because I did not go prematurely gray. Rather, I seemed to gray right on time. 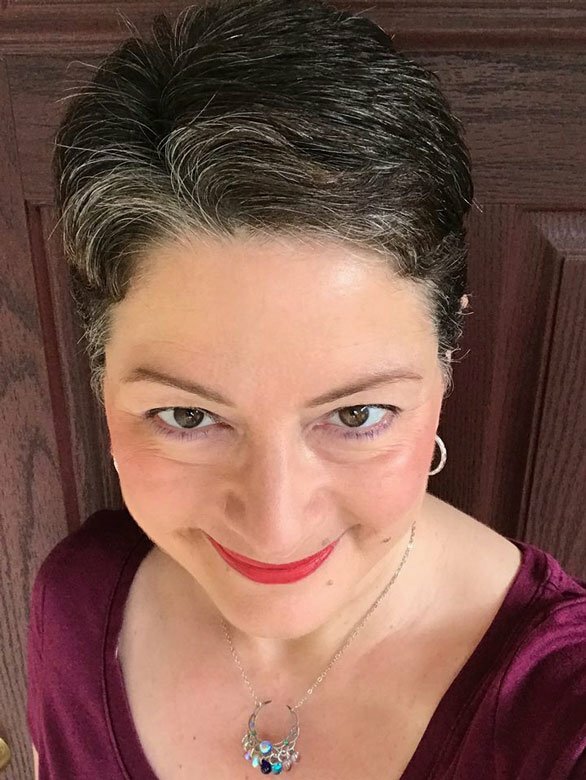 I remember I started to see a sparkly gray here or there when I was about 38-40, but by then I’d already been going to a salon for a couple of years for a single process demi-permanent color that was a golden reddish brown. It was basically my natural shade, with the red tones amped up ever so slightly. 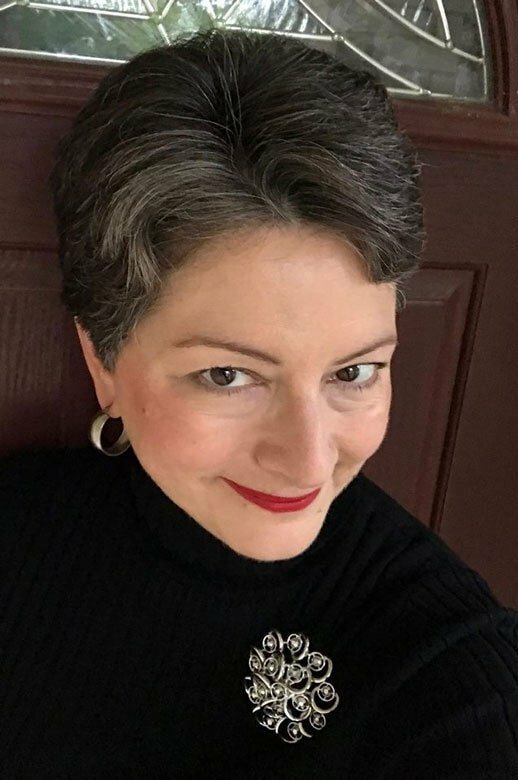 I’m not sure why I started doing that, other than it seemed fun to experiment with a little color and everything I read said to “warm up” hair color and makeup when you start to age. 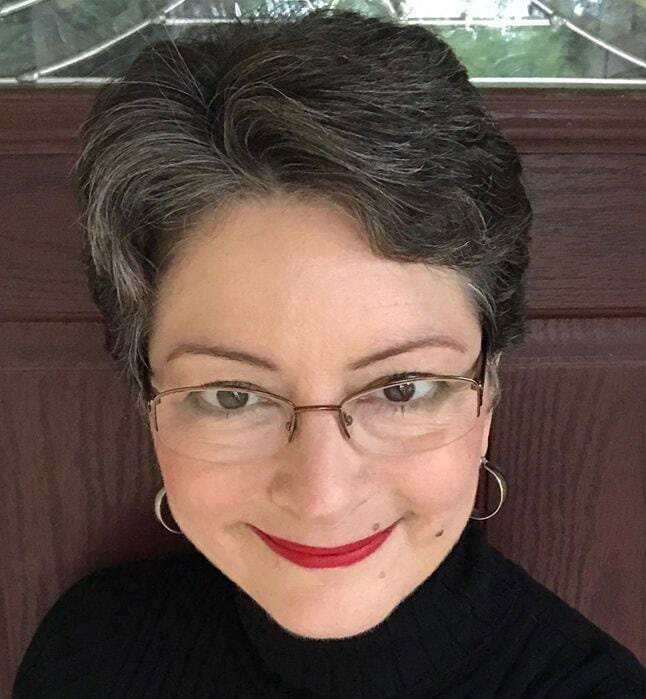 I wasn’t particularly concerned about gray hair at that time, because I didn’t have much, and the color that I was having done blended over whatever was coming in. By the time I was around 43, I had to tighten my belt, and couldn’t really afford salon color anymore. I briefly considered stopping color altogether, but I think by then I was a victim of social conditioning. Women in their 40’s who have some gray color their hair. It’s just what they do, and nobody questions that. We all just sort of fall in line naturally, and without a lot of fuss. We wear makeup, and we color our hair if we are “of a certain age”. June 30th 2018-Cut Shorter With More Layers-I’d planned on keeping this cut throughout my transition. 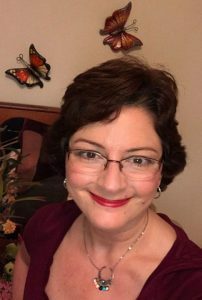 So, being on a tight budget, I naturally went to box color, choosing what was by all accounts the best drugstore box color, and following the standard advice for self-coloring at home, which was to stick within one or two shades of your natural hair color. 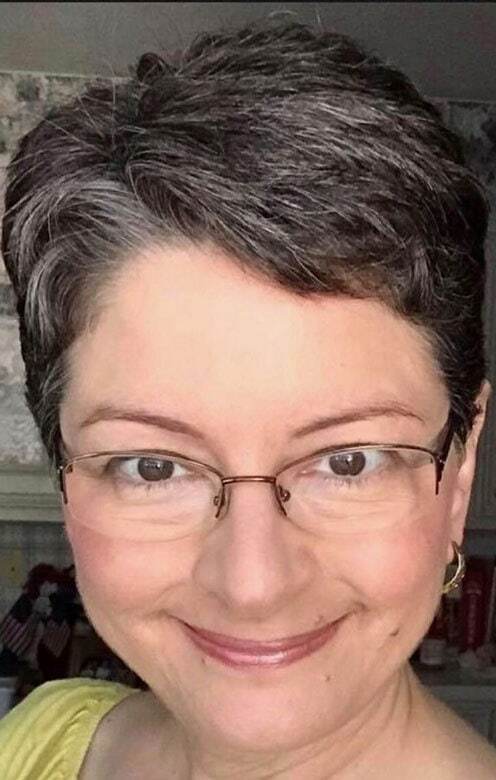 That went on for nearly 10 years until I started to hear about women going gray and loving it. Hair color had begun to damage my hair more as well, and it wasn’t taking the color as well as it did at first. I know now this was because the gray that I have is a very white shade, which was hard to color with a product from the drugstore. Even so, it still looked fine to the casual observer. Neither friends nor family ever said anything to me about my gray hair because I’d always fallen in line with cultural norms and colored over it. I’d get positive comments now and then about my dyed hair…mainly that it looked good and natural, and I did a good job with it. I was seeing more damage though, as the gray started to grow in, and I was not happy. After 13 years of dyeing, I was tired of damaging my hair more as the years passed, and having to do it every 3 weeks to completely hide the roots that grew in. Also, I began to see many women who had transitioned who looked really amazing. I became curious about what I had underneath the color, and how good I might look if I dared to grow mine out as they had theirs. The few friends I told were either supportive and positive or didn’t express any opinion at all—-radio silence. I took that as disapproval, but it didn’t bother me. I joined a couple of online support groups right away and got all the positive comments I needed on those to carry me through the transition. I will say this–had I been working outside my home, I would have been a lot more self-conscious during my transition. Co-workers and the general public can be pretty judgey, and knowing myself pretty well, I know I would have felt I was not looking as polished and professional as I like to look in a workplace environment. Being home most of the time, I have very few people to pass judgment on me. No one has been mean online either (yet). I dyed my hair one last time and then threw my other boxes away so I wouldn’t be tempted. I also decided I was going to cut shorter with more layers. When I began, I had a short bob with side-swept bangs. After a couple of months growth, I cut to a more layered, shorter, but still over the ears cut that worked well with my naturally wavy hair. I really liked that look and planned to keep it throughout the transition. However, I am impatient and couldn’t wait to be DONE. So, 3 months in, I had my hair cut into a short pixie, and kept cutting that shorter and shorter until all the dye was gone! July 24th 2018-This was the look that was the last straw for me. I HAD to cut to a pixie to hasten the process. September 7th-It looked good here, but I had run out of patience. September 21st 2018--Fully Transitioned & WAY too short, but I really didn't care. I was done! I’m done with the transition and I feel such a sense of accomplishment! Now, I’m in the process of growing out my extremely short pixie. Into what, I’m still not sure. But, I’m enjoying the growth I have already. Longer hair (even a long-ish pixie) allows my thick, wavy hair do its thing. I’m happy with how I look, even though this isn’t my final look. Because I was willing to cut very short towards the end, it took me 5 months start to finish. It probably only would have taken 3 if I’d been willing to take the plunge and do a short pixie right away. Whether your hair is long or short, I do highly recommend having layers cut into your hair. Those are tremendously helpful in disguising roots in the first few months. If you’re dark brunette and dyeing within that color range, your leftover dye will go orangey when you stop touching it up. For that, Joico Color Balance Blue Shampoo and Conditioner once a week can tone it back to looking like freshly dyed hair. It looks great the first day you do it, but if you’re washing your hair throughout the week with regular shampoos and conditioners, the orange comes back almost immediately. So, it helps, but it doesn’t last. Do it on the one day a week when it’s more important for you to look your best. Or wash your hair less frequently if you can tolerate that. For your daily shampoo and conditioner, choose a sulfate-free formula. I use Shea Moisture Shampoo and Conditioner, which is available at Target. Very moisturizing and gentle, and truly sulfate-free. I also use argan oil and coconut oil as leave-in conditioning treatments. The idea with transitioning hair is to baby it as much as possible. Otherwise, it will tend to look frizzy and dry. I use Jhirmack Purple Shampoo & Conditioner once a week to make the salt as white as it can be. Daily, I also use Jhirmack 5 In One Leave In Silver Brightening Spray. For me, keeping my whites white and bright is very important. I like the contrast they make against my still medium-to-dark brown natural hair. These products don’t seem to affect my natural brown hair but have a very positive effect on my gray/silver/white hair. Because it’s still short, I wash my hair daily with the Shea Moisture Shampoo & Conditioner, spray on the leave-in, and let it air dry. Once it’s a bit longer, I will have to start to blow drying it again, so I’ll probably try to go to washing only every other day instead. I also still put in a couple of drops of Kate Blanc argan oil, or a tiny amount of virgin, cold pressed coconut oil (from the organic section of the grocery store) as a leave-in conditioner if I feel my hair is extra dry that day. 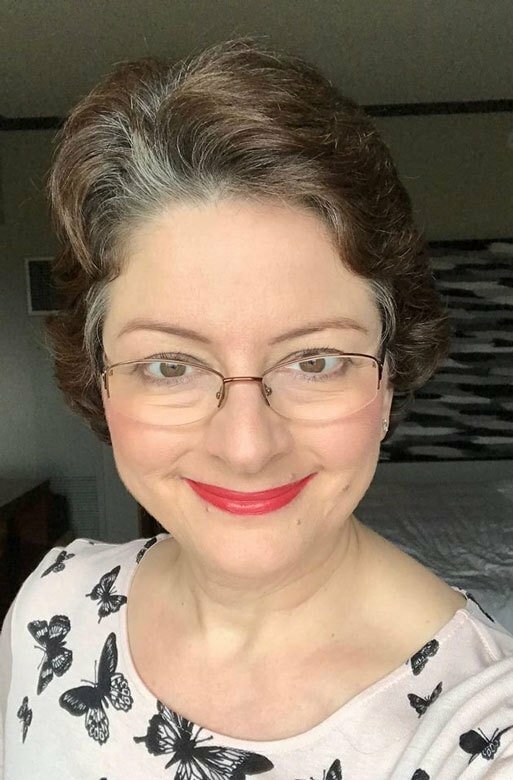 When I was first starting out, I bought a couple of Kindle books…”Silver Hair, A Handbook” by Lorraine Massey, and “Going Gray Beauty Guide” by Jan Rogers. These books reinforced the notion that going gray is a legitimate thing to do, I can do it, and it’s all going to be okay. The ladies listed above are very positive and upbeat, and convinced me that I could really do it too! All three are simply beautiful with their natural silver hair and they gave me a lot of confidence to go forward. On Pinterest, I searched for and pinned mainly the “end result”, not the transition. I’d already decided I was going to be a quick cold turkey and haircut transition, so I was very focused on how I’d look at the end. So, on Pinterest, I wanted to see what sorts of makeup looks and clothing colors were best on people with fully transitioned hair. I also started following all the “Silver Sisters” I could find on Instagram. Again, not for the transition, but to see what they were doing with their hairstyles, makeup, and wardrobe. These kinds of groups are extremely helpful for keeping the transitioning person going till the end, feeding their self-esteem, and for advice when they need it. Once I’d transitioned, I didn’t find the groups quite as helpful and I didn’t have a whole lot to say anymore. The groups are an integral part of the transition process though, and I highly recommend them. If you are going through a transition, you will need the support and the positivity to offset any negativity coming at you in your daily life. 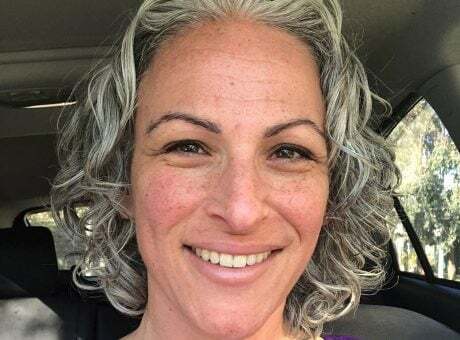 One note about gray hair, and salt & pepper hair specifically…The undertones of your skin and your eye color do not change throughout your life, no matter what color your hair is. If your skin has a golden undertone, and you have brown eyes like me, that will not change. 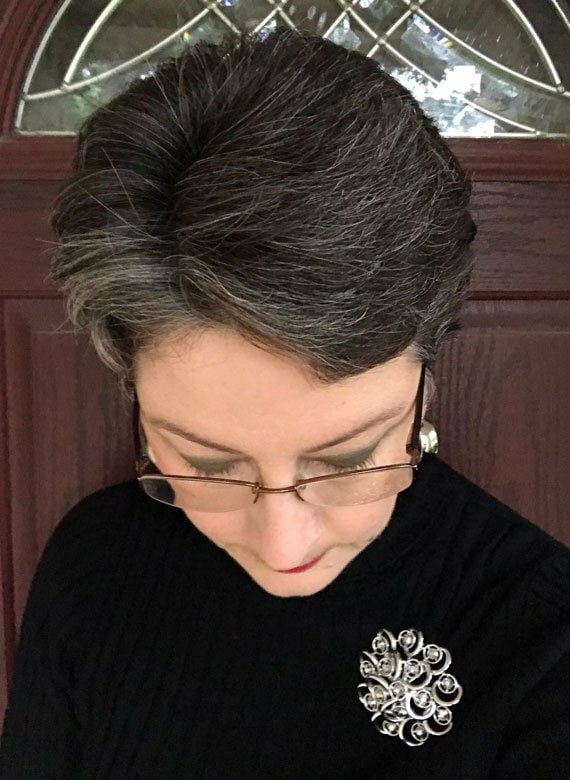 There is a lot of advice out there about THE perfect colors to wear with gray hair. This is not a time to fall into lockstep with all that advice–take it with a grain of salt…AND pepper! Letting your hair go natural means you will have to feel your way through what colors to wear. Your makeup and wardrobe palette may change a lot or a little, or not at all. I took it all very literally during my transition and went out and bought a neutral toned foundation, which looked terrible on me, so I went back to my regular foundation with the golden undertone. I still wear my “Peach Me” & “Rum Raisin” Revlon lip colors too, along with a few new cool toned reds and even a purple-ish one I picked up for my new hair, “Wild Orchid”. And I rock orange and yellow blouses when I feel like doing so. I guess what I’m saying is that each woman is different. Each head of naturally gray hair or salt and pepper hair is unique to that person. You absolutely do not have to switch to an all cool-toned palette if you’ve been warm-toned all your life. Now is not the time to follow convention–even newly minted “Gray Is Beautiful” and “Gray Hair Don’t Care” convention. It’s the time for you to be a rule breaker, take some risks, try different colors on for size, and decide what YOU love. BE YOU! 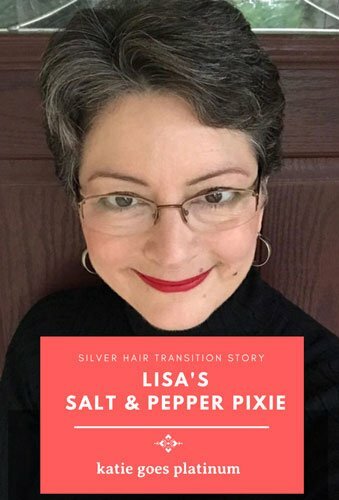 I feel that those of us who are not all gray, rather are more in the salt & pepper category have a different experience than our silver sisters who have mostly gray hair. Our transition is, in some ways, easier. It’s not such a big difference in the before and after, and the during can be disguised a bit more easily. Also, for me and others who still have more pepper than salt, it’s not so much about “going gray”. We aren’t ALL gray. It’s about being ourselves, and not being embarrassed that we have some gray in our hair that will likely increase as we grow older. That socially conditioned embarrassment that sends us running to the salon or the drugstore needs to be eradicated. There is no reason why anyone should feel like coloring is their only option when the grays start to arrive. You see your first gray hair…what do you do? You can color, or you can keep your hair natural and let them come in. That should be a legitimate option that is supported by friends, family, hairdressers, and society in general. 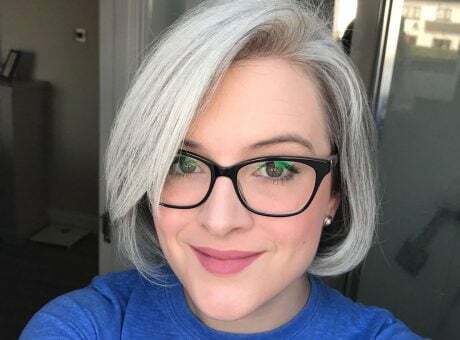 I hope the Silver Revolution has the effect that leaving your hair natural and learning to work with your naturally changing color is a perfectly valid option. We aren’t there yet. But, that’s my dream for the cultural change that I’d like to see, and maybe even help lead myself! Lisa, you look adorable with your pixie haircut! 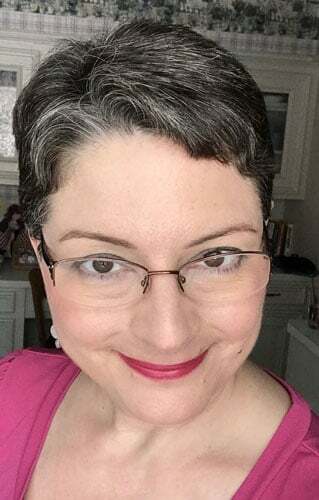 I’m at the start of transitioning to gray from dark brown and thinking of cutting my 3 – 4″ hair into a pixie once the skunky line becomes more pronounced. You’re an inspiration! Thank you. Thank you for your story. You are my inspiration to take the plunge! You are so beautiful~inside and out. You made my day, Cyndi…Thank you! I’m so happy to know that I’ve helped. I’d love to follow your progress. Let’s connect on Instagram if you have an account there! LOVE the pixie cut. I have similar hair to you—- thick, wavy, dark, naturally salt-and-pepper, and have been dying it a shade or two lighter or darker than its natural color (depending on my mood) for years. At 42, I have decided to stop dying my hair due to the grey roots showing up 2 weeks later (who am I trying to fool? not to mention I dont have the time for it) My husband does not think it is a good idea, but I am completely comfortable with the change, and feel like a big weight has been lifted off my shoulders. In fact, I am actually going to dye a couple of grey lights in to accentuate the salt-and-pepper, where there are natural patches of 100% grey to get rid of the old dye. It has been 4 months since the last single color dye touched my hair, and I feel more confident and true to myself. WHY try to look younger— a) it does not work well and b) age and maturity is a gift. Your hair looks amazing. Thank you, Erin! I totally agree on the trying to look younger thing. People whose main goal is to look younger than they are, as opposed to looking good (healthy, glowing, polished, all that stuff), are missing the point of “beauty”, I think. Your husband will probably be pleasantly surprised at how great you will look when your transition is complete. 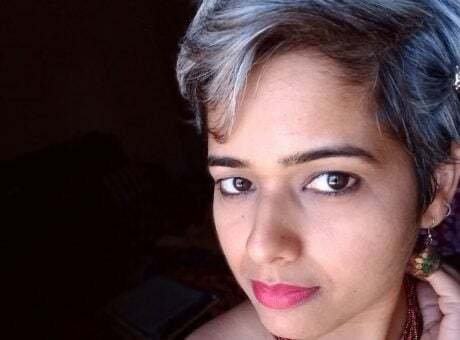 The biggest improvement that comes when ditching the dye is hair health. It really does look SO much better when we aren’t damaging it every couple of weeks just to keep our naturally beautiful color at bay. Why do we do this? I feel it’s almost all cultural conditioning rather than a preference for dyed color. I love that more and more women are waking up to this reality! I love reading these stories! They are all different but honest portrayals of these journeys. Keep them coming! Thank you, Jonie! ❤️ I feel very honored to be featured, and I’m thrilled to be able to (hopefully) encourage other women.